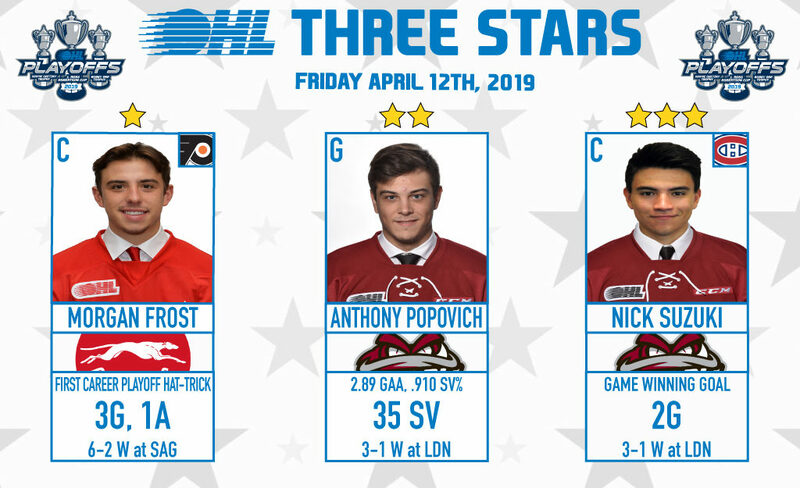 Philadelphia Flyers prospect Morgan Frost had a night to remember, recording a career playoff-high four points including his first postseason hat-trick as the Soo Greyhounds skated to a 6-2 win in Saginaw. Initially down 3-0, the Hounds have won back-to-back contests to return home with a wave of momentum for Game 6 and Frost played a big part in the latest triumph. The 19-year-old from Aurora, Ont. now has 18 points (7-11–18) over 10 playoff contests, the league’s second-highest total. Frost, who represented Canada at the IIHF World Junior Hockey Championship in January, recently wrapped up his second of back-to-back 100+ point campaigns. He was Philadelphia’s first round pick in 2017. 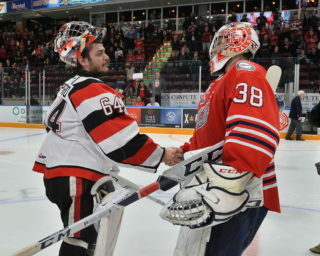 Veteran netminder Anthony Popovich brought his best stuff on Friday, turning aside 35 of 36 shots as the Guelph Storm took a 3-1 road win in London. The Storm stay alive, winning their second straight contest to send things back to Guelph down 3-2 in the series. 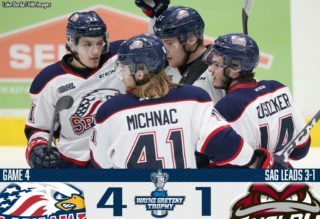 Popovich provided a number of big saves throughout the night to give the Storm a chance to win as Nick Suzuki scored the third period game winner to force Game 6. Popovich, who comes off 39 saves on Wednesday, improves to 6-3 in the 2019 playoffs with a 2.89 goals-against average and .910 save percentage. He attended training camp with the Dallas Stars last September. 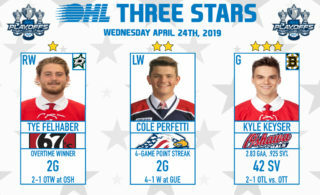 Montreal Canadiens prospect Nick Suzuki was buzzing on Friday, netting the third period game winner along with an empty netter as the Guelph Storm wrestled away control of the series momentum from the London Knights with a 3-1 road win. Suzuki led the Storm with nine shots on goal and was 10-for-15 in the faceoff circle, scoring a pair of goals in his hometown as the Storm forced a Game 6 at home on Saturday. The 19-year-old has 14 points (8-6–14) over nine playoff contests. 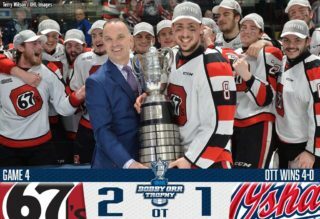 He was originally a first round pick of the Vegas Golden Knights in 2017 before being dealt to Montreal in September 2018.